Who could beat the Gonzaga horses? No one. Gonzaga himself had bred his Italian horses with Arabians. 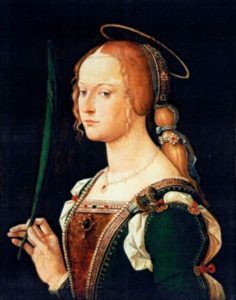 Gonzaga’s controlling wife, the snooty Isabella d’Este, had a burning desire to be the best at everything. Always. No one dared go up against her. But she met her match in the teenage son of Pope Alexander VI. 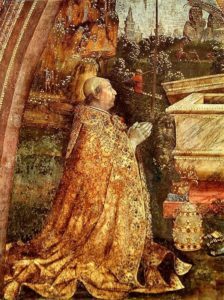 Cesare Borgia, a Bishop of the Church, also had a driving fire to win at everything – women, cards, horse races. 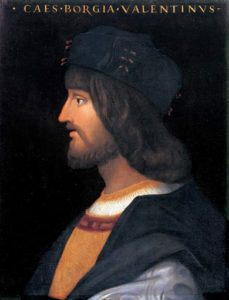 But even with his father just elected Pope, young Borgia was still a lowly Bishop. This ate at him because his frenemy, Giovanni Lorenzo De’ Medici (born Dec. 11, 1475), had been named a Cardinal on March 26. 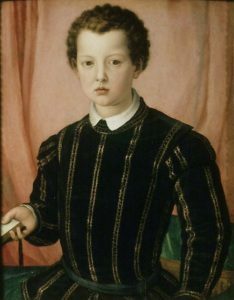 At 16, Giovanni was a couple of months younger than Borgia. 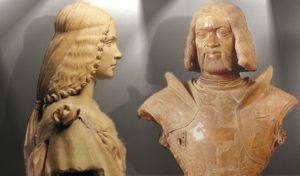 On August 11, 1492, Cesare put all that out of his mind that summer day in Siena, to concentrate on how to beat Gonzaga’s horse at the Palio Race and see Isabella’s fury. (A palio was an expensive bolt of fabulous cloth.) Borgia knew he had a good horse, but not as good as he needed. He needed something extra. On race day, the two horses – Gonzaga’s and Borgia’s – came racing through the town square, neck and neck, ahead of the field. The townspeople were screaming and yelling for their favorites. Near the finish line, Borgia’s jockey slipped off his horse. The extra weight off, the horse leaped forward, first across the finish line! “Foul!” cried Isabella. Gonzaga laughed it off as a good joke. The race committee awarded Cesare the palio. Furious, Isabella complained. And sure enough, in the morning, the race committee reversed its verdict; they gave the palio to the triumphant Isabella. Cesare didn’t care. He was already on his horse, rushing to Rome. He had just heard the news – he was now a Cardinal, thanks to a little sleight of hand on his father the Pope’s hand. Boys will be boys! Same as always, through the ages.